The new Marvel Super Heroes sets are focused entirely upon Spider-Man and his heroic allies, as one might anticipate given the imminent release of Spider-Man: Into the Spider-Verse. This range does not necessarily take direct inspiration from the upcoming film but a number of Spider-Verse characters are included. 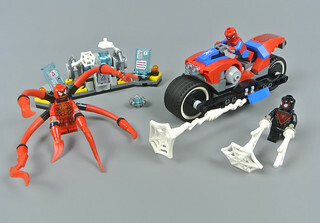 76113 Spider-Man Bike Rescue contains three such minifigures, all of whom are brand new. Moreover, I think Spider-Man's motorcycle looks pretty good in official images, despite the dubious necessity of a spider-themed vehicle, so this should prove to be an appealing set. 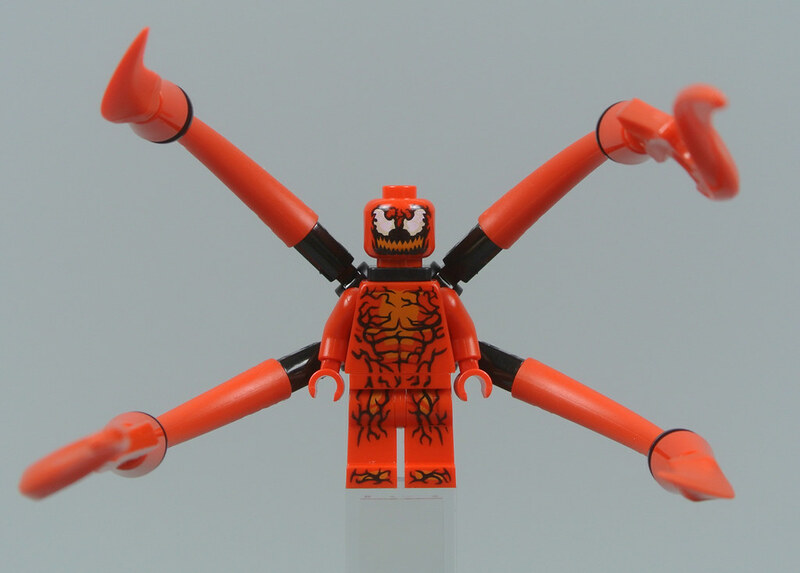 A brand new Spider-Man minifigure was created for 6873 Spider-Man's Doc Ock Ambush in 2012 and the same figure has appeared in thirteen subsequent Marvel Super Heroes sets. This updated version is therefore very welcome, featuring a large spider emblem on the torso as well as dual-moulded legs. The decorative spider on the back of the torso has also been improved. 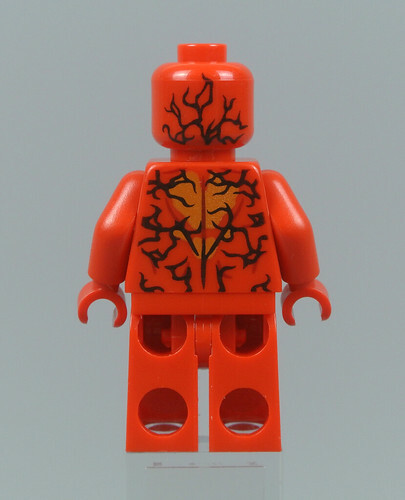 Furthermore, the torso's base colour has been swapped from blue to red which has a remarkable effect upon the minifigure as a whole. Its eyes now include some metallic silver highlights which look fantastic and the webbed pattern on the mask is reasonably intricate, corresponding with the designs on Spider-Man's chest. Miles Morales is a central character within Spider-Man: Into the Spider-Verse so this minifigure should prove very popular. It appears almost identical to the previous rendition from 76036 Carnage's SHIELD Sky Attack, featuring an attractive black suit with red highlights and updated muscle definition, but that is not an issue in my opinion as it would be difficult to improve upon the design from 2015. On that basis, perhaps the set might have included a separate head to depict Miles without his mask. He frequently appears wearing that guise in the comics and an alternative head would distinguish this minifigure from its predecessor. Nevertheless, this is an excellent rendition of the character, despite its familiarity for seasoned Marvel Super Heroes fans. 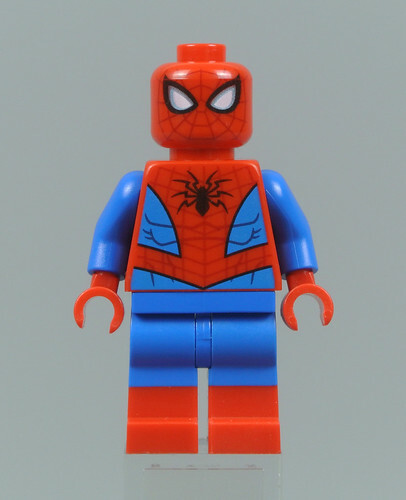 Both incarnations of Spider-Man come with a selection of web-based accessories, ranging from narrow strands to larger webs. Each component has several attachment points so they are extremely versatile and the new pieces feel consistent with old elements. I am particularly pleased with the web handcuffs that are worn by Carnage in the image below. Carnage previously appeared alongside Miles Morales in 76036 Carnage's SHIELD Sky Attack from 2015 but has undergone several changes since then. 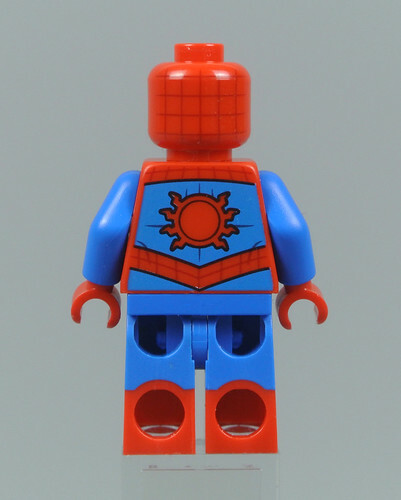 His elongated tendrils are the most notable such difference and are attached to a neck bracket that was created for the Avengers: Infinity War subtheme, granting them a much greater range of motion than the tendrils on the older minifigure. The designs on Carnage's head, torso and legs are equally distinctive. There are fewer black streaks and some orange highlights have been introduced. I think the updated design looks superb, although the minifigure from 2015 captures more detail and its printed arms should have been remained intact. The villainous symbiote also comes with two additional tendrils which can be held in his hands. Spider-Man has little need of vehicles in the comics but they are important for play and this motorcycle looks pretty good to me. Its curvaceous bodywork is very sleek and I like the consistent colour scheme of blue and red. The broad wheels are connected using Technic liftarms which feel sturdy, allowing the vehicle to lean sideways during corners. A stud shooter is mounted on the motorcycle's left side but this weapon does not launch standard 1x1 round plates. Instead, the set comes with a pair of pearl silver spiders. 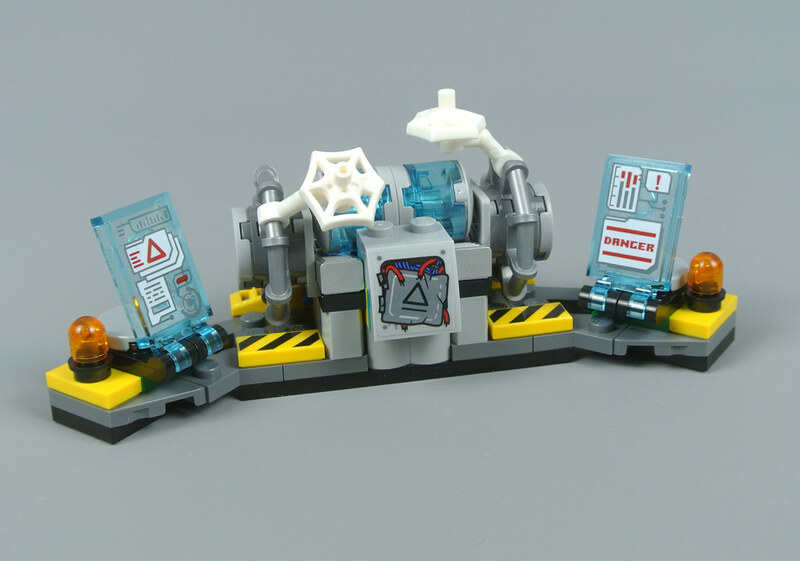 These were originally designed for the NEXO Knights range but they work perfectly here, loosely resembling the robotic spider drones which Spider-Man occasionally deploys. In fact, the drones appeared prominently in the recent Spider-Man video game. The motorcycle is also equipped with a web launcher. I like the twisted web strand but it seems rather fragile and the launcher looks bland without the web, unfortunately. The engine looks splendid though and I like the decorative sticker in front of the handlebars. Moreover, the headlights are mounted on a couple of red 1x2 rounded plates which are relatively rare, only appearing in more expensive sets. 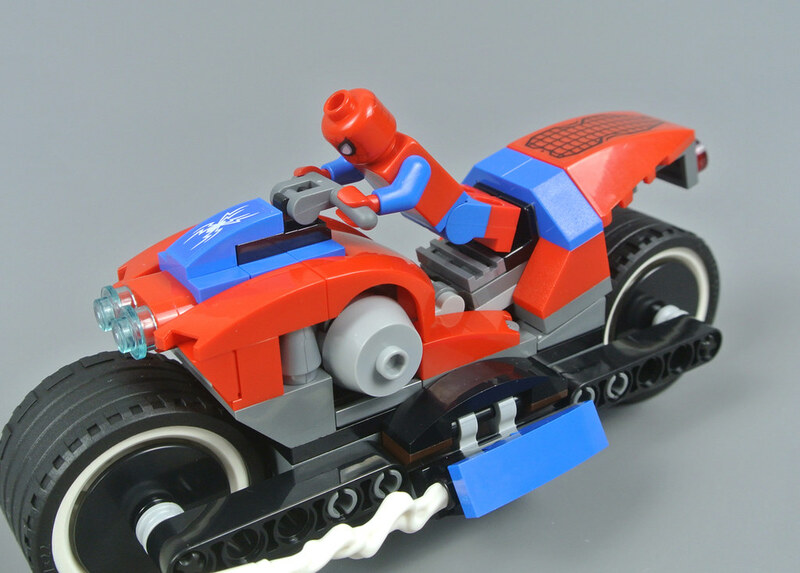 Spider-Man looks rather small when riding his motorcycle, although I like the minifigure's streamlined posture. The angled rear mudguard looks great, featuring an additional sticker with a webbed pattern and two trans-red lights above the tyre. The white wheel rims are also a lovely detail, complementing the web strands. However, the motorcycle feels very similar to Batman's vehicle from 76053 Gotham City Cycle Chase which is disappointing. 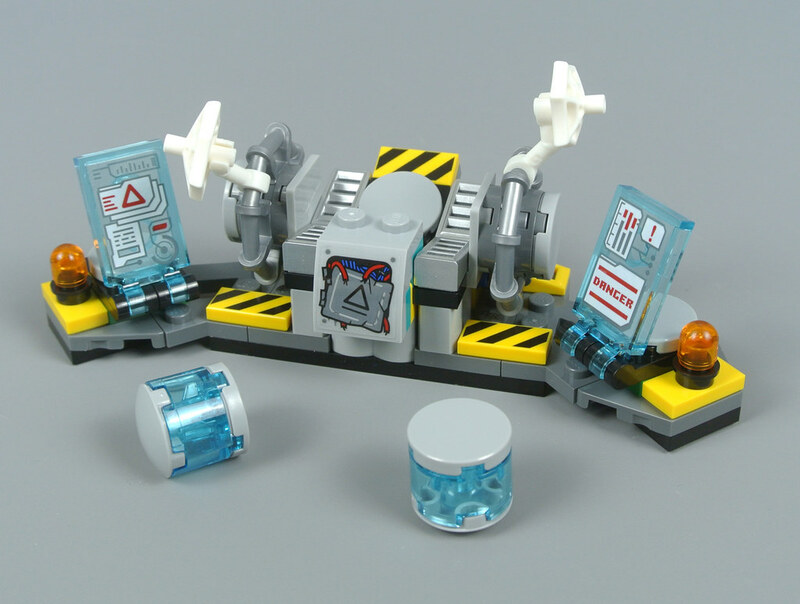 Power generators and other industrial equipment have appeared in many previous Super Heroes sets but this example stands out, due primarily to its bright colour scheme. I like the printed hazard warning stripes and the trans-light blue displays look marvellous. The damaged access panel on the generator features a triangular symbol and some red and blue wires, perhaps in reference to Spider-Man's attire. Pressing a lever towards the back of the model will cause the power cells to explode, as demonstrated below. This function is simple but it works well and I like the metallic silver 1x2 grille slopes underneath the power cells as these only appear in four other sets. The tiny spider webs attached to the generator look good too and will hold the power cells in place before the explosion. Spider-Man's motorcycle is probably the weakest aspect of the set but it does offer reasonable play value and looks fairly sleek. I would therefore recommend this set, which costs £19.99 or $19.99, although those who already own 76036 Carnage's SHIELD Sky Attack may wish to focus their attention upon the larger models that contain exclusive characters. I hope you have found this review informative. Let us know by liking this article and share your thoughts on the set in the comments. Love the new cartoon version of spidey and the motorcycle can't wait to get my hands on this..
Kinda funny. The Lego Group say, that Deadpool is too bloody and agressive, he won't be in any set in the future. But let me be objective: monsters like these (venom, green goblin, carnage... stb.) has no place among the youngsters below 7-8 years. Simply can't understand LEGO, what was in their head. The new Spiderman looks a little odd to me, although it's nice to see a new version of him. 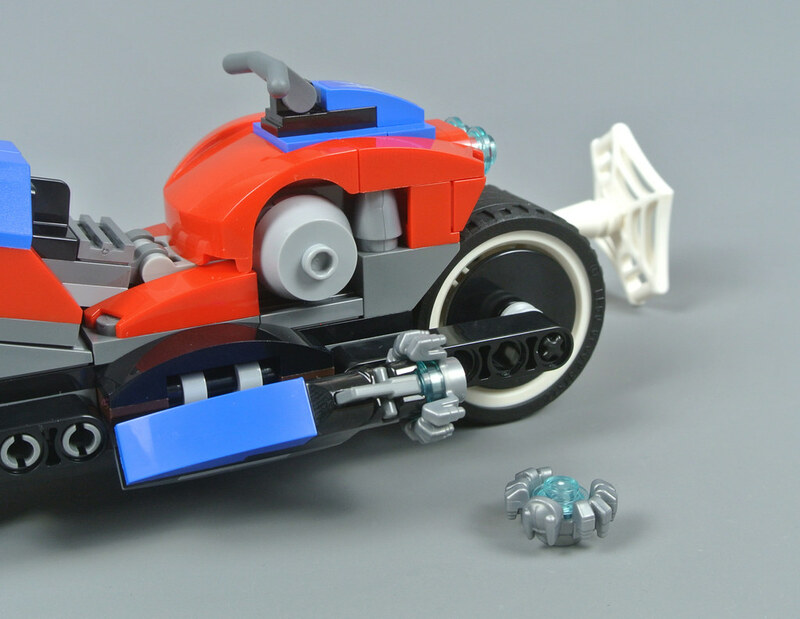 My first thought was that the bike looked amazing, but then I saw it next to the minifigure, and it is way oversized. Its an awesome model without the figure though! I just feel like Lego could have done a better job with character distribution here? Both Miles and Cletus recently appeared in a budget set together. Swapping either of them out for another character (perhaps a Sandman/Carnage swap between this and 76114) would have made this set perfect, as I'm sure parents with little Spider-man fans (the primary target for this price point) have already previously snapped up 76036 and might be inclined to pass on this one. The way I see it, Miles needed a substantial update and Carnage has been updated almost unnecessarily. Oops. Well, at least they got Spider-Man right for once in a while. The range of spider-vehicles in this wave are pretty dumb: It's like Lego's trying to take the Batman formula they've used for years and stitch it on to other heroes. @DaftArcher20968: Correct. Definitely still kid targeted, but 4+ sets almost never have entirely brick-built vehicles, usually opting instead for a preformed frame/chassis/cockpit. 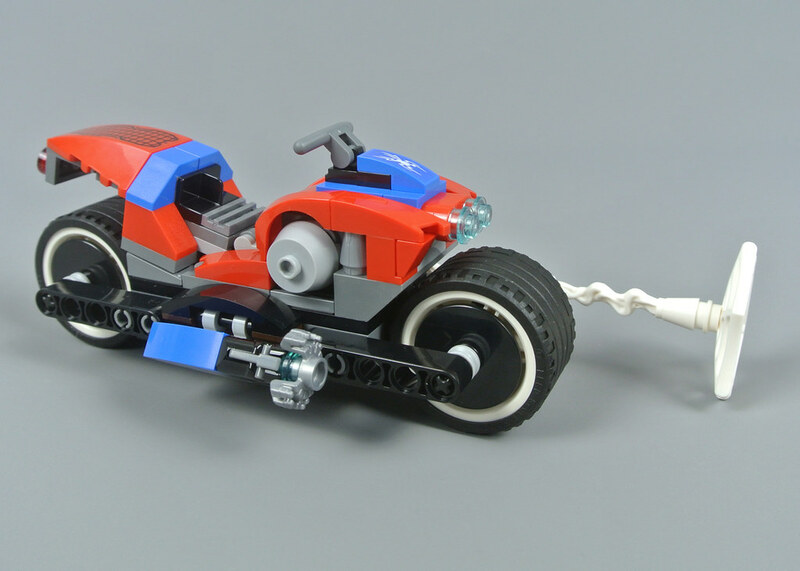 @mafon: That seems to be the tendency in a lot of LEGO’s more fantasy/adventure-oriented themes (Agents, Ninjago, Super Heroes, etc), since it helps the vehicles feel more extreme and also lets them get a lot more creative with their shapes and details than with more realistic, City-scaled motorcycles. Plus probably helps those sets compete better with other action toys which are scaled more closely to action figures instead of looking puny. I certainly understand this set feeling sort of redundant for people who got Carnage’s Sky Attack a few years back, though this will probably be popular with kids who become more aware of Miles as a character in the wake of “Spider-Man: Into the Spider-Verse”. The new web blast pieces are really clever. I imagine they’ll be IP-locked so we probably won’t see them outside superhero sets, but for MOCs I can think of a lot more used for them than the Batman accessory pack from last year which was very obviously all bat-shaped pieces mostly suitable for ornamental uses even outside of Batman MOCs. Whereas many of these will be more suited to any MOC where you might want spider webs where neither the existing (much bigger) parts not stickered/printed elements seem appropriate. Another day, another superhero set with an oversized motorcycle. I do like the updated Spidey fig, though. Will definitely be getting all the new Spider-Man sets, if not for anything more than the new alternate spider men. But I do really like the new vehicles and villain designs as well. I love this set. 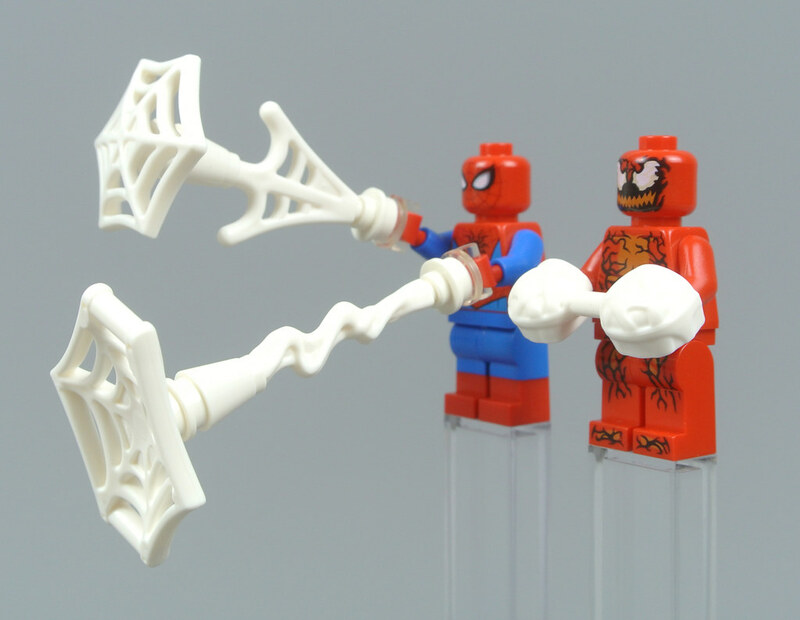 The minifigures are great with a new Spider Man, Miles Moralas, and Carnage. The bike looks pretty cool and the side build has a nice play function. Overall I would buy this set but I don't know how much it costs so yeah. If anyone would like to tell me the price I would love that and if it is in the text I really need to pay close attention. Am I the only one that’s going to buy any of these sets simply for the minifigures? 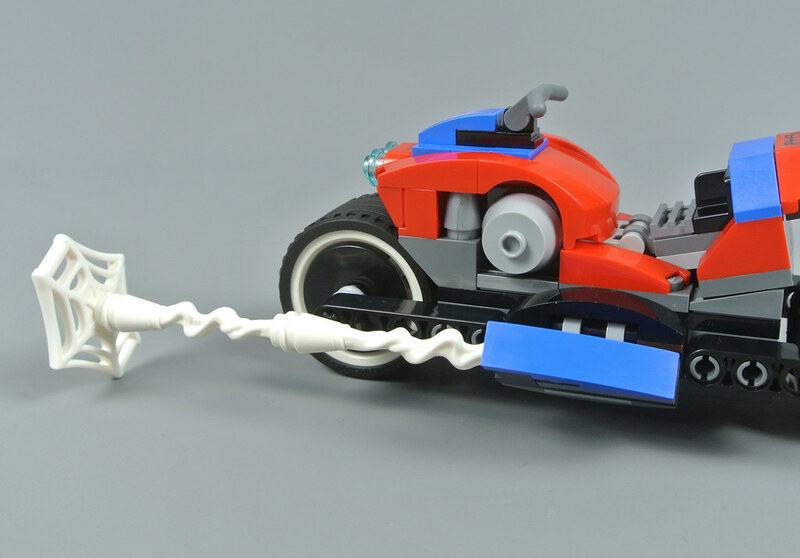 I know one shouldn't be too harsh regarding scale with sets like this, but the bike looks like a truck in relation to the minifigs. Really ridiculously oversized. @HUN_Sector: I am not necessarily condoning or condemning this, but I believe the issue at LEGO is that Deadpool uses 'realistic' weapons, but monsters are a fantasy situation. That is to say, there's less reason to fear a monster that doesn't resemble anything that really exists to a reasonable degree, as much as a man in leather with swords and guns who swears, which is more 'real'. @JVM not to mention that the Venom movie wasn’t rated R but was PG-13. One of the primary reasons for Deadpool not showing up in mainstream sets anymore is the fact that his films are rated R so parents know to have their child avoid the character. The Venom film was PG-13, and so it really doesn’t matter if LEGO puts Venom or Carnage into a mainstream set, despite the fact that the Venom movie (which I very much disliked) should have been R rated. This set looks kinda meh to me though. I’ll probabky try and snag the other set with Spider-Man 2099 seeing as though he’s my favorite iteration of Spider-Man. @Psychic Tempest Zero: Whether or not it makes sense for Spider-Man as a canon character, I think it's a more effective strategy than people might think for Spider-Man toys. For decades toy companies have been making goofy Spider-Man themed vehicle toys, because Spider-Man is one of the most popular superheroes with kids, and kids also tend to be crazy about toy vehicles. In fact, the Spider-Mobile in the comics was originally created as a really snarky way of responding to the constant pressure to give Spider-Man some kind of vehicle in the comics that could become as iconic as the Batmobile and be sold as merchandise, purposely playing up how disastrous and impractical it was. Yet sure enough, it was exactly the kind of thing that toy makers would turn out to have lots of success with in the future. Thanks for the reviews. It confirms that the reason I buy these sets aren’t updated enough to justify a purchase. However if I didn’t already have Carnage and Miles, I would look into this. I’m guessing I’ll want a different set with the new Spider-Man so I should be good there. Pretty Cool set. Still think Im gonna Pass. Meh! Will still get it just for the minifigs though. More spare parts for the parts bin!